Truly a mixture of the old and new, the J.K. Adams hanging stemware rack is suspended by hi-tech steel aircraft grade cables. 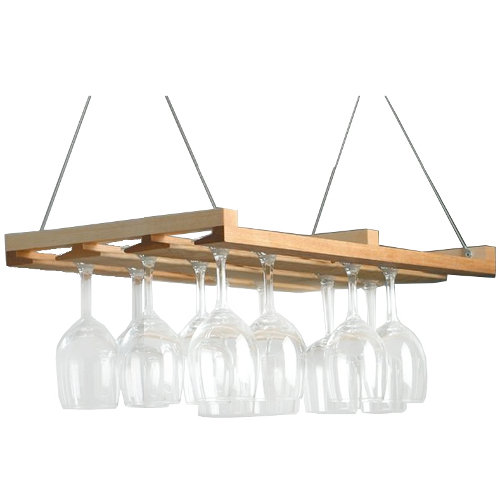 Your stemware pieces hang in three rows with access from both ends. Peg-stops in the middle of each row prevent glasses from pushing through and off the end. Made in the USA, it is constructed from maple hardwood and the installation hardware is included. J.K. Adams has been the leader in producing fine quality wood products for over 60 years in its Dorset, Vermont factory. Using the best wood in New England as a commitment to outstanding product quality, they selectively harvest hardwoods from replenished and managed forests.